Google facing major problem for attracting users for Social Networking thought they closed some services and focusing on Google+ . They are meanwhile focusing on Gmail also. New Look of Gmail provides much new experience of Email. Here some of new features of Gmail. New Gmail is more clear then any other previous version of Gmail as well as its more easy to new bie to use it first time. Conversation in previous Gmail was messy. Conversations have been redesigned to bring the content of your messages to the forefront, and profile pictures make it easier to see who you’re talking with at a glance. You'll have more control over Gadget widow as well as side bar. Clicking on "..." will popin-popout the gadget window. The new search box makes it easy to customize your search and find exactly what you’re looking for. You can also create a filter right from the same place. Tool bar changed with new look and give much more easy way to interact with email. Changed "Scroll bar". Just changed look of reply for email. It's all good enough. Below video show overview of new Gmail look. How to switch to new look? On the right-bottom corner you'll get the notification of new Gmail look. Image below show the notification. Click on "Switch to the new look". How to Switch back to old look? If you feel you are not ready to use new look. 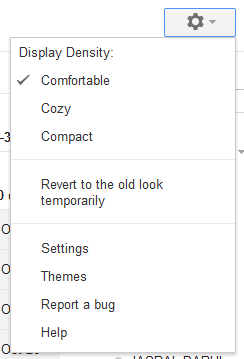 Gmail allowing that for while so you can continue to old look. Image below show how you can move to the old look. Click on Revert to the old look temporarily. You can also change new look in you way by click on Display Density.